The rally that started in November keeps going and there is no clear sign yet that the advance may be over. The MoM indicator stays in the +8 euphoric zone, but it has turned down which means we can do some first selling at this point. If MoM drops below +8 then do some more selling. See last week’s article. The Earl (blue line) has turned down, which suggests a pullback is coming up. But maybe it will be no more than a few days hiccup before stocks climb to another record. There is no way to tell at this point, we just need to be aware that this market can suddenly go into blow-off mode here. Such a move becomes very difficult to read in its final stages, and traders who find themselves on the wrong side of it are typically given little or no chances to get out without significant losses. The LT wave for February was partially successful. After some hesitation in the first week stocks surged to new records in the expected strong period until the 15th. The next expected weak period didn’t produce any decline and the final days saw new records again. For March there is a peak value on the 1st followed by projected weakness until the 10th. Then a strong period until the 15th or 16th. A second weak period is expected until the 27th. The lowest LT wave value of the month comes on the 7th, with a second low on the 27th. Peak values come on the 1st, 13th and 29th. Both the Nasdaq and the S&P 500 have been making a significant breakout to the upside, brushing aside overhead resistance and not showing any intentions of looking back. This is a scenario I have been warning for last week. We still have to keep an eye on the remaining possibility of a failed breakout, as I discussed in my mid-week post. But if the market keeps forging ahead into March then the scenario of a failed breakout would become unlikely. The MoM indicator is shown at the bottom of the chart and has now climbed above 8 for first time since early August. For individual stocks it is quite common to see the MoM go above 8 during strong rallies, but for broader market indexes a +8 usually happens only a few times per year. The +8 euphoric zone means the market is red hot and the risk for a sudden pullback, if not the start of a bear market, is high. But that doesn’t mean a pullback is imminent. Just as often a +8 gets worked off through time. That’s what we got in Aug-Oct 2016. We see three earlier cases of MoM +8 in the chart (circled in blue) and you wouldn’t have missed much by selling on those occasions. Conversely, when MoM drops below -6 into the blue zone it usually marks tradeable bottoms and a -8 (= depressed) will typically indicate a major low. I have marked 7 such opportunities in the chart. It is easy to see that you would have done well by doing some buying at those -6 opportunities and just hold until the next +8 peak. Again, for individual stocks it is more common to see -6 or even -8, but for market indexes it is quite rare. We can use this to do swing trading with just one indicator. 1) You do not need to sell on the very first day the MoM climbs above 8. As long as it keeps climbing you can wait. Just move your stops closer to the market when MoM is +8 and wait for MoM to turn down to start selling. If MoM falls back below +8 then do some more selling. More often than not you will be able to get back in at lower prices in the ensuing weeks or months and that’s how you can lower your cost basis. MoM in the -6 zone gave us good entry points, but in the second half of 2013 we see a series of +8 peaks with small pullbacks that take the MoM to the zero level but not all the way down to -6. This happens when the market goes into “climbing up the stairs” mode. Then pullbacks are short and shallow with each new thrust creating another step higher. So, be prepared for this possibility. Actually, the current +8 as shown in the first chart could be the start of such a series. Two pullbacks since the November lows have seen the MoM bottom at zero before turning back up. This is climbing up the stairs until we see a deeper drop in MoM. MoM reached +8 near the peak in October 2007. That was followed by a series of MoM lows in the -6 zone and a persistent failure to reach +8 on rallies. During the crash stage in late 2008 MoM stayed in the -6 zone for months. In this kind of situations patience is of the essence. After a lengthy stay in the -6 zone you will almost always see a secondary low that takes MoM back to the -6 zone, but not as low as during the crash stage. You want to buy on those secondary lows, not during the crash itself. Here we got two of them, November 2008 and March 2009. The next +8 didn’t happen until July 2009, almost two years after 2007 peak. There was a nice rally in early 2015, taking Oil back up to $60 and making many investors think that the bottom was in. But it failed to reach the +8 zone, suggesting ongoing weakness. Soon the price of Oil was sliding to new lows again with MoM staying in the -6 blue zone for almost two months. And then a final washout decline into early 2016 lows just above $25. Notice how the final low in February 2016 came with MoM bottoming well above the -6 zone. 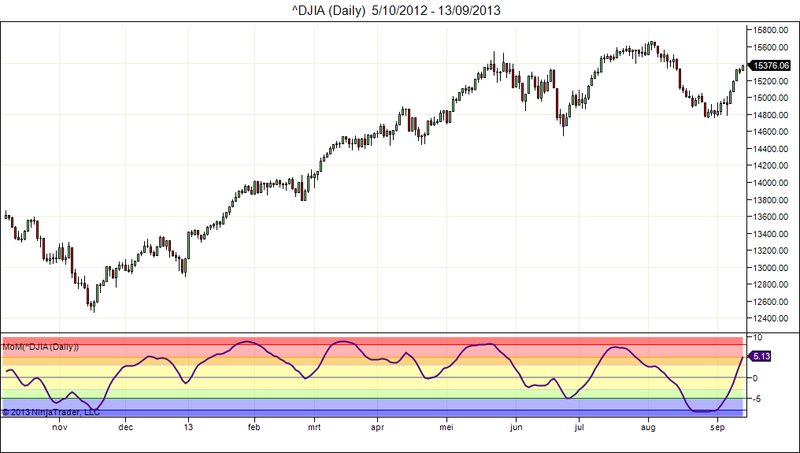 This is a major bullish divergence, a common feature at the end of long declines. The next +8 peak came in August 2016, almost 3 years after the previous one. This is how patient we have to be in major bear markets. Reading the market is a difficult challenge and always will be. There are no perfect tools for that purpose. But MoM indicator usually does a decent job. The MoM for major indexes is posted on my Twitter every day. I have now automated the calculation of my key reversals to a large extent, saving me time, and from this week onwards the presentation format is changed a bit. The weekly and the daily reversal tables are now shown separately, making space for some additional info to be shown. A long term investor can do well by going with the weekly table only, while a shorter term swing trader would rather use the daily table and try to trade with the daily trend. But, it is always good to look at the bigger weekly picture first and then consider the daily moves. The bullish or bearish status is now given as a bright green or red color in the BB column. Next to it you find our key reversal level, which is the level to watch for stop-loss or for entering/reversing positions, always to be used based on close prices only. The MoM indicator comes next. It is now printed in green when the MoM is going up, and in red when MoM is going down. Then we have two new columns. The first one shows us how many weeks have passed since the given market started its current trend, with the last column showing the percentage change since the beginning of that trend. 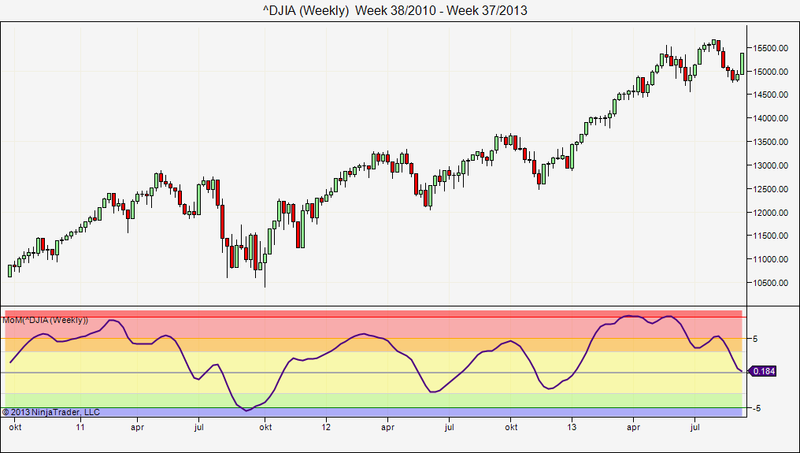 For example, we can see the Nasdaq has now been in bullish(green) status for 41 weeks, and has gone up 26.71%. Bonds have been bearish for 22 weeks and are down 8.11% over that period. You can see that all markets here have been moving in the expected direction, as the %Ch is displayed in light green. Whenever a market has gone against the expected trend, the %Ch is displayed in pink. * All covered stock indexes remain in weekly up trends and now have upward weekly MoM again. As we pointed out last week, MoM turning back up soon was an important condition for the bull market to continue, and that’s what happened. * Bonds (TLT) have been bearish for 22 weeks, but MoM is to the upside and TLT is once again closing in on its weekly key reversal level. A weekly close above 109.20 would be a long term bullish sign. * Gold remains bearish with downward MoM on the weekly level. * The EURUSD is quietly grinding upwards. Has appreciated only 3% in 12 weeks, but sometimes these stealth bull markets have long ways to go. Time will tell. * Oil is still bullish, but weekly MoM is to the downside and oil is getting very close to falling below its key reversal level. A weekly close below $99.74 would be a long term bearish sign. Note: here we see an example of %Ch displayed in pink. Bonds are in rally mode (green) since 1 day, but the price has gone the other way so far. * All covered stock markets are in fresh rallies with upward MoM. * Bonds (TLT) are in rally mode again. * $EURUSD is quietly ticking upwards. * Oil (CL) is quietly sinking downwards. * We have no new targets this week. * The Nasdaq has broken through the 3830 target, and is already testing the 3930 level, which is the next hurdle. * The S&P has also broken above the 1730 target. Here we set sights on 1799 and 1820 next. * $EURUSD is still testing the 1.36 top target. If it goes a little bit higher then 1.3950 will be the next top target. * Stock markets have continued to rally, and weekly MoM is now up again for all covered markets. Daily MoM is slightly down for FTSE100, which has been lagging a bit, but remains up for the other markets. * Bonds (TLT) have gone into rally mode, as was already suggested by rising MoM last week. Coming off a double bottom, this rally has better chances of seeing some follow through than the failed breakout we got in August. * Gold bounced back towards its daily key reversal level last week, but failed to get above it and closed the week nearly unchanged. The picture remains bearish. Weekly MoM has turned down, while the daily MoM has turned up with the mid-week bounce. * The EURUSD rally has gathered some steam last week, so maybe the breakout from choppy range will be unexpectedly to the upside. But, our 1.36 target level will have to be taken out if this rally is to continue (see target zones). * We have a new bottom target for gold at $1215. * The Nasdaq and the DAX have broken above their first top target. Next up for Nasdaq is now 3830 and for the DAX 8920. * The S&P came close to its top target at 1738 and turned back down from it. * Bonds (TLT) retested their bottom target at 102, and bounced back up from it. * All covered stock markets are back in rally mode with daily momentum (MoM) going up nicely. Weekly momentum for most markets is now starting to turn back up as well, which means stocks will probably be showing a fully bullish picture again by next week… unless we get a sudden downturn. * All stock markets remain in bull status, and well above their weekly key reversal levels. * Bonds (TLT) are still in bear status and decline mode. But both the daily and weekly MoM are going up. Bonds are coming off a very pessimistic MoM-7.7 bottom on the weekly chart, which indicates a nice rally is in the cards once it can close above its daily key reversal level at $104.49. This could happen as soon as the Fed announces tapering of its QE program in a classic “sell the rumor and buy the news” reflex. * Gold has gone into decline mode, and is now seeing quickly falling daily MoM. I wouldn’t consider to buy gold until we see MoM stabilize and turn up again. * The Euro/US$ is back into rally mode, but not very convincingly. This remains a very choppy market, with little or no momentum either way. It will go into a good trending move eventually, but we have to be patient. I think the better odds are for a move to the downside, so on a close below the daily key level at 1.3213 I would consider taking short positions. * Oil remains in rally mode, but both the daily and weekly MoM are going down. The repeated failure to climb above $110 and the weakening momentum suggest that the path of least resistance is down for oil. Time will tell. * We have one new bottom target for the Euro/US$ at 1.2870. * The Nasdaq reached its top target at 3730 last Tuesday and has remained stuck at that level for the rest of the week. * The DAX is also close to its top target at 8550. * Bonds (TLT) are testing their bottom target at 102 again. * Oil seems to have failed on its second attempt to get above its $109.40 top target. A few weeks ago I introduced the “MoM” indicator in the context of my weekly key reversal levels. In this post I will give more info on the MoM and how to use it. The main idea behind the key reversal levels is “market orientation”, where is the market right now, and where it appears to be going… While charts are very nice and can give us an intuitive “feel” about a given market, they generally contain way too much information. All the years prior tell us where the market has been, but all that “history” is not necessarily very helpful information. We can keep an eye on the past, and it deserves perhaps 20% of our attention, but if we are to trade succesfully then 80% of our focus has to be on the *now*. And that’s the problem with charts, they typically show us only 1% now and 99% past. So, they tend to keep a trader stuck with the past. The key reversal tables try to summarize where we are right now. Is it a bull or bear market, and is the market rallying or declining? At what key price levels can we consider a change from rally to decline (or from bull to bear)? That’s all a trader or investor really needs to know. The MoM indicator is an even more condensed format as it simply tells us where we are on a numeric scale between 10 and -10. You could compare it to the Richter scale for earthquakes, or a market thermometer if you want. Good buying opportunities typically occur when MoM bottoms below -5 in the blue pessimistic zone, as was the case in September 2011. Bull markets will usually see the MoM rise into the optimistic pink or red zone, where they can stay for a while. So, a rise above +5 is not a reason to sell immediately, but one should watch out when the MoM starts going down from optimistic levels. Ordinary counter trend pullbacks or rebounds will typically bottom or peak in the yellow zone (+3 to -3) before resuming move in direction of the longer term trend. Notice how most of the time the market moves in the same direction as the MoM, and that’s why we watch carefully whether MoM is going up or down. On weekly charts it is rare to see MoM go below -8, but when it does so it are almost always great long term buying opportunities. Over the past year we had three drops into the blue pessimistic zone, which presented good buying opportunities. You can also see why MoM rising into the red optimistic zone is not a reason for instant panic. In ongoing bull markets we will regularly get a sideways pause or mild pullback with the MoM falling back into the yellow neutral zone before starting the next swing to the upside. We then get a series of MoM peaks in the red optimistic zone. So, we can just move our protective stop closer to the market whenever the MoM turns down in the red zone. That will get us out when a deeper correction comes along, as was the case in May-June and in August. There are more possible uses for the MoM, but that will be for another post. And in case you wonder: yes, it is possible to trade based on this MoM indicator only. In fact, a patient long term investor can do very well based on the weekly MoM only.